Gallery 200 is happy to host as the Featured Artists for the Month of March the students from the 7 elementary schools in West Chicago. 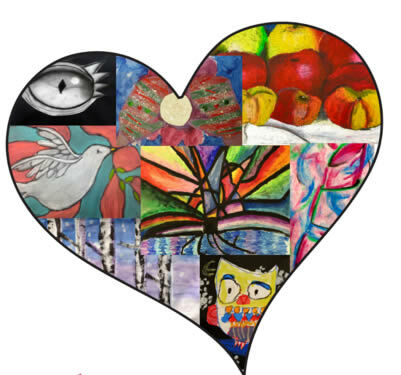 March is Youth Art Month and this show will display a wide variety of works from grades 1-8. Students use many different media to show their creativity in how they interpret art style, subject or cultures from around the world. Youth Art Month is a nation wide initiative and Gallery 200 is proud to support young artists through this show and give them and their families an opportunity to participate in a real gallery setting. The student art exhibit will consist of artwork from Pioneer, Turner, Indian Knoll, Currier, Wegner and Gary Elementary Schools as well as Leman Middle School. Gallery 200 welcomes District 33 artists for the fourth year in a row, and is pleased to support local schools and celebrate “March, Youth Art Month” with the National Art Education Association. This show will be on display at Gallery 200 for the entire month of March. Please join us to show your support for these young artists.